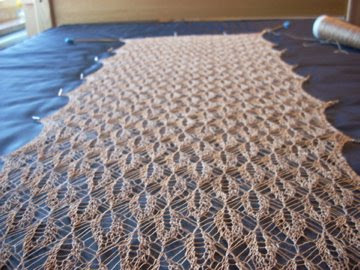 Just some quick proof that I actually am making progress with the Habu shawl. I have completed 23 of the 40 repeats for the body, then I have to knit on a border. Any guesses at how long this will take me? Here's some help: The first five repeats took me about five months to do. The next 18 took me three days. Your guess is as good as mine! What a great pattern - I just wanna touch it. Haven't been to the Habu mountain yet...yay, more inspiration. Very pretty! And nice sweater and cute Ishbel!